I came to wild garlic late. Others have known about it’s deliciousness for many a year, but I first tasted it just a couple of years back. Last year, I was determined to forage my own and use it in my cooking. Here’s a quote from a previous post: By the way, in the UK, when we talk about wild garlic we’re usually referring to ramsons (allium ursinum), a wild relative of chives. From wiki, I learn that “the Latin name owes to the brown bear’s taste for the bulbs and habit of digging up the ground to get at them” which also explains another of it’s aliases: bear’s garlic. My first stash came early in last year’s wild garlic season, courtesy of the lovely MarkyMarket, who generously shared his secret foraging location with me. I had been intending to make a soup but instead used only some of the wild garlic leaves to stuff a chicken before roasting. Lovely! With plenty of leaves leftover, I decided to blitz the rest raw with oil and pop them into the freezer, in tiny plastic boxes. My second stash was foraged when the wild garlic was in flower, carpeting swathes of grassy roadside verges in rural Dorset. Much of this harvest was enjoyed as a wild garlic tempura, which was delicious! Again, I had leftovers, and blitzed with oil before freezing in small portions. In the year since then, we’ve gradually used up our stock making this delicious pasta which, after the first time we made it, has become a firm favourite. The mushrooms really absorb the flavours of the wild garlic and the rest coats the pasta nicely. In this instance, we happened to use one pot of frozen wild garlic leaves and another pot of frozen flowers and stems. Put the pasta on to cook (unless it's fresh and needs much less time). 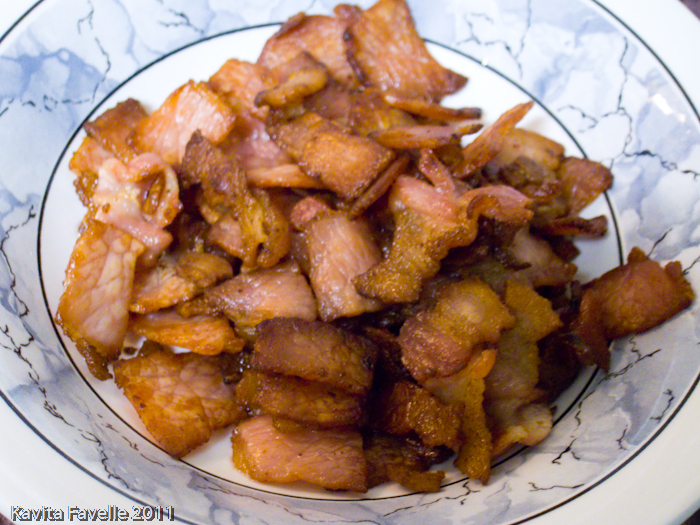 Fry the bacon until cooked and just beginning to crisp, then set aside. 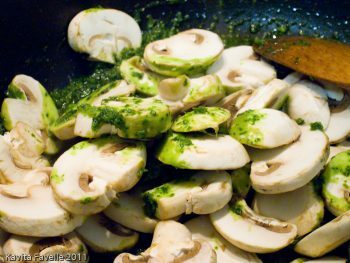 In the same pan, slowly cook the mushrooms in the blitzed wild garlic and oil. We give our frozen wild garlic oil time to defrost before adding the mushrooms. When the mushrooms are ready, stir the bacon back in. Drain the pasta well and stir it in too. 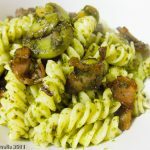 If you have found an abundant source of wild garlic near you (please forage sustainably), do consider preserving some as we did so you can enjoy this simple pasta dish year round. 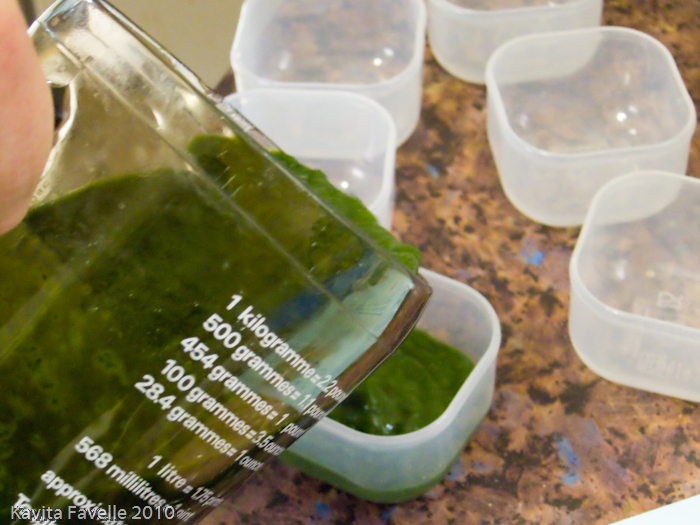 20 Comments to "How to have wild garlic all year round? 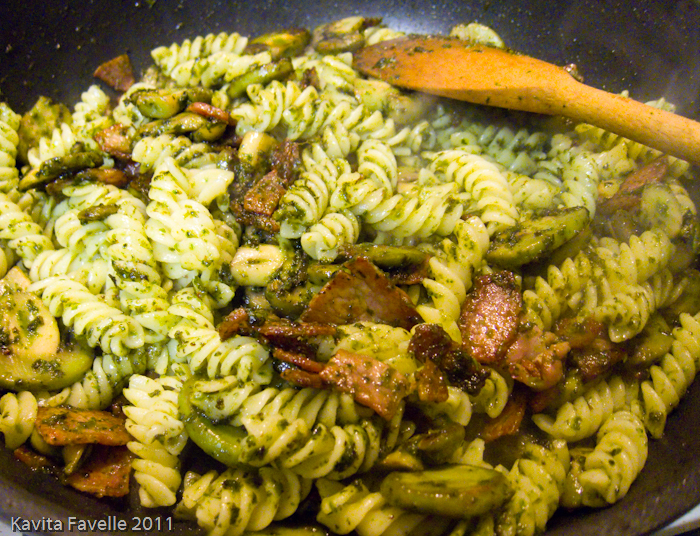 Wild Garlic, Mushroom & Bacon Pasta"
genius idea with the freezing… I picked so much in my local wood this weekend I didn't know what to do but my last thought was to freeze… excellent idea… I just cooked them into a quiche (will be posting mid-week)… I also am late to the whole wild garlic thing, but I love it too! I need to start foraging. If anyone can recommend a good spot for wild garlic around Archway/Finsbury Park/Highgate I'd be exceedingly welcome! Yum, Kavey! 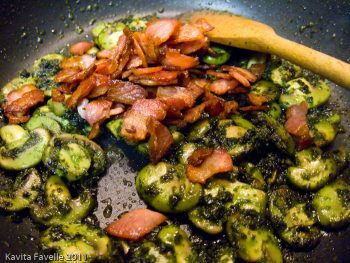 For those of us without wild garlic, do you think a sauce made with garlic scapes would make a reasonable sub? Dom, so glad you like the freezing idea… we freeze a lot of the produce we grow in our garden so it seemed an obvious option for me! Celia, I just looked up garlic scape, and it might work well! Give it a go! Also, you might be able to grow your own wild garlic, if you have shady cooler corner, under some trees works well… you're looking for allium ursinum. Will take on board your sage advice to freeze the stuff in future. Was it in the fridge? Mine can keep for months like that. Simple and smart, thanks for the tip. Last year, there was a “Food for Free foraging walk” held in Leeds. If you are a total newbie like myself, one of these might be planned in your area. 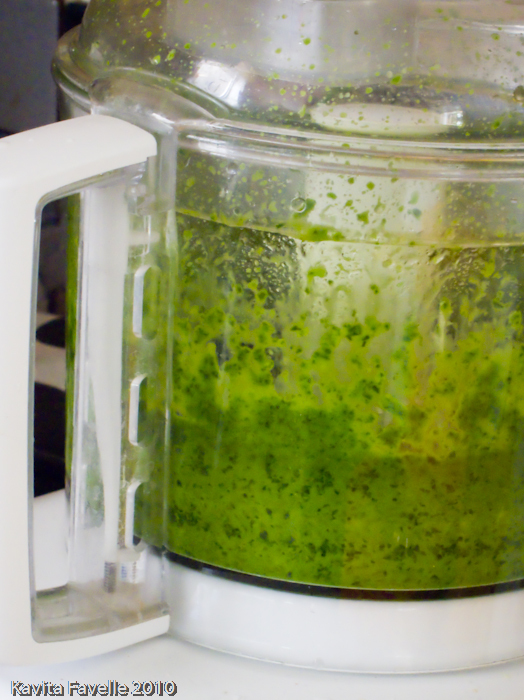 Great recipe for wild garlic – I wish I had a stash! LOVE this idea- have only really put it through salads and eggs so far. Pasta and risottos, consider yourself warned. You're next. Try adding fresh ginger,chilli…unrefined olive oil…a little sea salt.. I have just read a menu in one of Torquay’s best restaurants for ‘This seasons Wild Garlick Rosti’ which I intend to make as soon as the weather dries up a bit and I can gather a handful from our garden. What oil do you use to freeze it? As I am thinking it may be used for hot or cold dishes through thebyear. I don’t have a food processor, so should I chop the leaves before adding the oil? I just use my regular vegetable cooking oil – nothing with a strong flavour, so any neutral oil such as sunflower, vegetable or similar. To get that pureed kind of texture, chopping finely may work, but you might want to try using a mortar and pestle to really get it into more of a paste. Or do you have a spice grinder that can handle wet spice pastes? That would do well too. could you put the whole bulbs into freezer bags without processing first? I don’t harvest the bulbs, just the leaves and flowers for wild garlic. Thanks for your tips Nigel, lovely suggestions. We also use it raw in salads, throw it into omelettes and frittatas, or stir into mash potato. We’ve used it to stuff a roast chicken too. So many ways to enjoy!